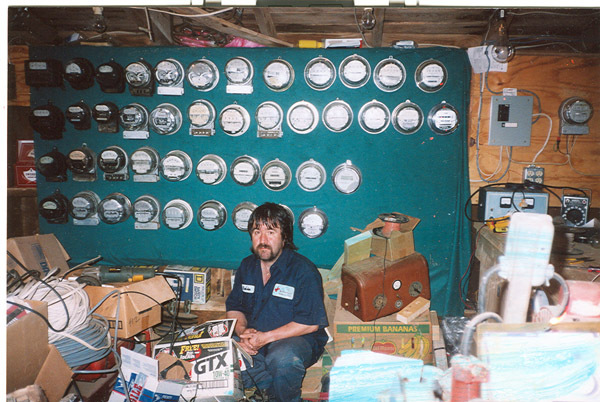 Circuit Man (Erwin Summer) sent in this picture of part of his meter collection. Let's let him tell us what's here! Hey Circuit Man.....you sure you have enough meters??? Now THAT's an unusal collection, lol! Nice collection. So circuitman, are those all strung up so you can assure the accuracy of your house’s meter? Man that is one humdinger of a page of meter nostalgia! I come across a few operational oldies once in a while, but lack space for them. The wife would get upset.... But if I come across anymore, I'll keep you in mind. Some of the DC services still left are pre-1920's. And there are a few 2-wire single phase 30A left here too. I leave them for the POCO, as they are thier property, but they never take them. They just get trashed. History of all kinds gets lost when unapprecited. Nice to see that some one does.